before being replaced by “Sam’s Crab Shack”. 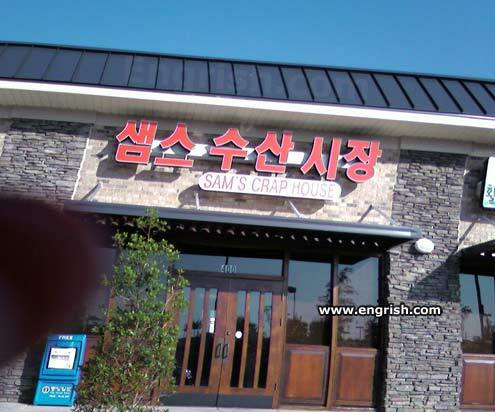 Sam’s Crap House, where you eat what you excrete! The house itself may be crap but the food in pretty good! Man…shouldn’t have hired that architect. The restrooms next to the Sam’s Club Superstore. Service is a little TOO good… the waitresses keep coming around to see how you’re doing,… and MY “business” is NONE of THEIR business! The crappy food is terribly good! The owner was a former employee of Sam’s Crab House down the street. He has a non-competition agreement with his former boss and the only option for him is this crappy restaurant. Home of the Original Steamed Crap with Rice!
. . . where being a pack rat never felt so. . . awkward. Looks like Georgians don’t take their Korean food so seriously. I’ve had enough of your potty mouth! My friend shouldn’t of slept with that waiter, now she has genital craps. Billy: Yeah, full of crap you louse. Audience are requested to remain seated throughout the performance! Sam’s crap is legendary, compared to all of the other lower quality crap. Our crap is large, fresh, and made to order. Man o’ man, Sam’s crap is good sh*t! This must be where all the unbought Snuggies and Sham-wows! go. Using the bathroom costs extra! What about this Crappy photographer? Keep your thumbs off of my Crap House! It looks like the City Wok restaurant in South Park may have a competitor chain to worry about soon. The food is steamy but never cooked. Public lavatories run by private companies, carrying recognisable branding and in competition with one another? Please light a match on your way out. Everything about the place is just crap, the food, the service, and the atmosphere!! I wonder if there’s anybody that has actually followed what the comments said. That’d be a show…. Discount toilets at Sam’s Crap House. Next to Lon’s Poop Shack. Endorsed by Ex-Lax and Preparation H.
So good, you’ll crap your hands. The fourth little pig used an eco-friendly building material. I’ve actually been there. And believe me, the first sign was more appropriate! Sam’s Crap House…We’re Full of It! Oh, so that’s what Shitake sauce is all about. Please note an important distinction: this is not a “Store”; this is Sam’s Crap “House”. Complimentary matches with every doggy bag. I’m impressed. I only have a drawer full of crap. My ex got all my crap.